Main Beach may be the most photogenic stretch of sand in the 57 kilometers of coastline running along the city of Gold Coast, though it’s much more than a pretty postcard. Functioning as a bustling marina and port, you’ll find a constant tide of activity to explore here, including active nightlife and dining options for every time of day. In this article, we’ll zoom in on the landscape, seaside and wildlife of Main Beach, and take you through the top attractions this vibrant shoreline has to offer. The beach itself contains many hidden delights and overlooked sights dotted up and down the Spit, such as the old bathing pavilion, Pavilion 34 which has been refitted as a casual beach cafe. The pavilion sells chikko rolls, potato scallops, pineapple fritters and good ole’ fish and chips while the interior boasts retro photos of the Main Beach of yesteryear. Snacks can subsequently be devoured in the adjacent Southport Surf Pavilion, dating back to 1936, and a sprawling park for oceanfront picnics. Budding Kelly Slaters can take a shot at catching the perfect wave thanks to any one of the several surf schools lining the beachfront. The majority of these schools, like First Wave and Get Wet Surf School, are steered towards getting beginners acclimated to the board and the water. These schools set you up with all the necessary equipment and gear you need to get started, as well in-water teaching from surfing experts. What’s more, multiple session times are available so there’s plenty of opportunities to catch the best tidal conditions. 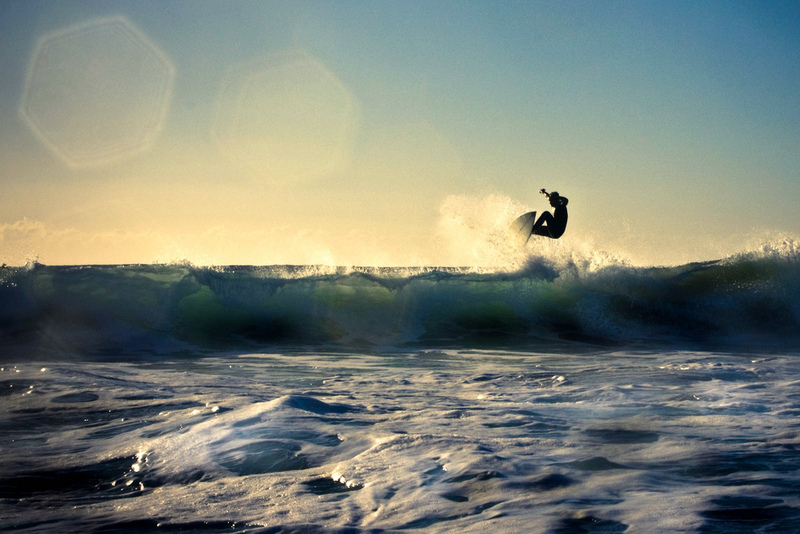 Surfing is Australia’s national pastime, so drop your inhibitions, pick up a board and give it a go, ya little ripper! Established in 1970 right on the Spit, the Gold Coast Fishermen’s Co-Operative welcomes shoppers onto several floating pontoon markets, all peddling fresh seafood at extremely affordable prices. This is a great chance to buy the freshly caught fish directly from the person who caught it, who will often happily share their favorite cooking techniques for each fish. The fleet of fishy finds here includes prawn trawlers, tuna long liners, and even a spanner crab vessel, all operating in the turquoise waters just off the Gold Coast to bring you the freshest catch possible every day. The boats open for business at 7am each morning and stay open until their produce is sold out, making mornings the wisest time for a visit. Watch out for: early bird shoppers – get there in the morning or your fresh catch may be gone! 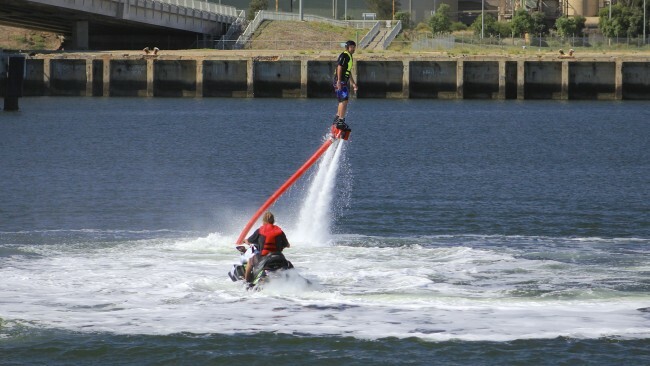 Take to the skies a la James Bond in any one of the three water-powered devices provided by Jetpack Adventures Australia: the Jetpack, the Jet Board or the Jet Bike. Catering to both individuals and groups, this bizarre adventure is available seven days a week for ages 10 to 100. The mechanical essence of the jetpack is surprisingly simple: it’s a backpack unit you’re strapped into by a 5 point safety harness (similar to race cars), and water is propelled from the powered unit into a 20 meter hose, which is forced into 2 jet nozzles on the jetpack. This propulsion effect is what lifts you up above the water. Two hand controls on the pack enable you to steer left, right, up, and down, which the instructors will show you in advance for safe handling. Your instructor will also provide a HEADZONE communication helmet to keep in contact with you throughout your exciting flight. This is an incredible experience for any traveler harboring secret superhero fantasies. Bordered by the triangle of Surfers Paradise, Southport is McIntosh Island Park, a true urban oasis for all the family in the heart of the Nerang River. On any given day, you’ll find peaceful picnics, tots frolicking in the playpark, strolling couples, and even the occasional wedding ceremony, thanks in part to the park’s proximity to many popular hotel reception venues. The large, shady trees supply a picturesque atmosphere and homes to several species of local birds, while a cascading stream ribbons through the park and flows under a much-photographed bridge for a quaint backdrop. Paradise Jet Boating’s premium ‘Adventure Ride’ is notable for its exciting tours of the local scenery, full of thrilling maneuvers to keep passengers on their toes at every turn. The ride travels over 35 kilometers through the Moreton Bay Marine Park, for 55 minutes of 360-degree spins, high-speed drifting, power slides, beach-buzzing, and other dazzling tricks along the Main Beach waterways, though you’ll still get plenty of breathing room to look out for dolphins and admire the waterfront’s grandiose mansions and yachts. When you’re home you can relive the adrenaline of this adventure again and again, thanks to the service’s Jetcam onboard filming system which records the experience on USB for posterity. Watch out for: wild turns – if you’re prone to seasickness, take care! 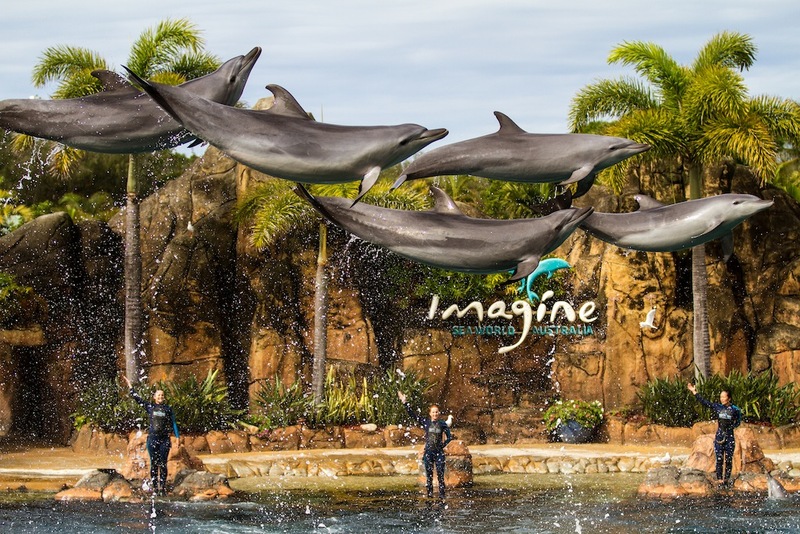 Seaworld Australia endures as one of the most popular tourist destinations on the Gold Coast today, allowing visitors to experience a face-to-face encounter with sea creatures both above and below the waves. Aside from the park’s famous, startling spectacles from trained dolphins and other Queensland marine life, Seaworld also features special shows hosted by the Teenage Mutant Ninja Turtles and Dora the Explorer for younger visitors, and a Jet Stunt Extreme show for thrill-seekers. A fig tree in the car park opposite the entrance to SeaWorld marks the start of Federation Walk, a community project launched to celebrate the Centenary of Australia’s Federation in 2001. This stunning 3.7 kilometer coastal walk winds its way along placid sandy stretches and green patches of regenerating rainforest, encompassing all the major highlights of Main Beach’s natural beauty. It’s all thanks to the tireless efforts of the Main Beach Progress Association and the Friends of Federation Walk that this beautiful section of the Spit has been lovingly preserved, and rejuvenated for future generations.